The US classic stamps issued between 1870 and 1888 are known as the Banknote Issues to US philatelists. Over this time period, the printing of US stamps was contracted out to the National Banknote Co., the Continental Bank Note Co., and finally to the American Banknote Co. These classic stamps are very popular issues with US philatelists. There are many printing and paper varieties, shades, the New York Foreign Mail cancellations of 1870-1880, and innumerable other fancy cancellation types to be found on these issues. The 3c denominations are the cheapest, and one can develop an impressive collection of fancy cancels, based on these issues, for only a modest investment. 1 Cent - Benjamin Franklin - Author, printer, politician, scientist, statesman, diplomat, and the first Postmaster General. 2 Cent - Andrew Jackson - American military commander and the 7th President of the United States. 3 Cent - George Washington - Farmer, military commander, statesman, and the 1st President of the United States. 6 Cent - Abraham Lincoln - Lawyer, politician, and the 16th President of the United States, during the American Civil War. 7 Cent - Edwin Stanton - Lawyer, politician, and the Secretary of War during the Lincoln Administration. 10 Cent - Thomas Jefferson - Farmer, politician, Governor of Virginia, author of the Declaration of Independence, Secretary of State under President Washington, Vice President of the United States under President Adams, and the 4th President of the United States. 12 Cent - Henry Clay - Farmer, statesman, orator, Senator from Kentucky, Representative from Kentucky, Speaker of the House of Representatives, and Secretary of State under President Adams. 15 Cent - Daniel Webster - Lawyer, statesman, Representative from New Hampshire and Massachusetts, Senator from Massachusetts, and Secretary of State under Presidents Fillmore, Harrison, and Tyler. 24 Cent - Winfield Scott - American military commander for 47 years and Commanding General of the US Army for 14 years. 30 Cent - Alexander Hamilton - Patriot, economist, political philosopher, and the 1st Secretary of the Treasury of the United States. 90 Cent - Oliver H. Perry - American naval commander, hero of the War of 1812. 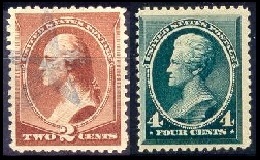 The US classic stamps, shown in the images above, were printed by the National Banknote Co., beginning in April 1870. 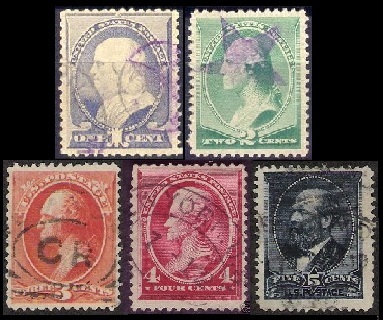 These stamps were printed on hard, white wove paper of excellent quality, and they are perforated 12. In keeping with the practice of the late 1860's, the paper of the first printings was impressed with "grills", in an attempt to prevent used examples of the stamps from being "cleaned" and then re-used. The grilled denominations, from the 1 Cent to the 10 Cent are shown in the image above (Sc. #134-39). The paper of the first 12 Cent, 15 Cent, 24 Cent, 30 Cent, and 90 Cent denominations (Sc. #140-44) was also grilled. These high values are very scarce and expensive. The grills come in two types. "H" Grill - about 10 x 12 mm. This grill was used on all the denominations. "I" Grill - about 8 1/2 x 10 mm. This grill is rare. The grills on these US classic stamps are usually very faint, sometimes with only a few grill points remaining, especially on the 10 Cent - 90 Cent denominations. Later printings by the National Banknote Co., through the end of 1872, were all on paper without impressed grills. The complete used set, without grill, is shown above (Sc. #145-55). The paper, printing characteristics, and perforations are the same as on the grilled issues. In about July 1873, the Continental Banknote Co. took over the printing of the US classic stamps Banknote Issues. The stamps are printed on hard, white wove paper and are perforated 12, as were the National Banknote Co. issues (Sc. #156-166, #178-79). The Continental Banknote Co. also used a vertically ribbed paper. The stamps printed on ribbed paper are worth much more than those printed on the regular wove paper. 1 Cent - The pearl at the left of the numeral "1" has a small colored crescent in it. 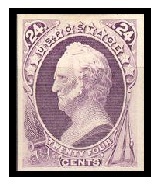 2 Cent - Under the scroll at the left of "U.S.", there is a small diagonal line. This stamp can also be identified by the shade, which is different from that of the previous printing. 3 Cent - The under part of the upper tail of the left ribbon is heavily shaded. 6 Cent - The first four vertical shading lines in lower part of the left ribbon have been strengthened. 7 Cent - Two small semi-circles have been drawn around the ends of the lines that outline the ball in the lower right corner. 10 Cent - There is a small colored semi-circle in the scroll at the right end of the upper label. 12 Cent - The balls of the numeral "2" are crescent shaped. 15 Cent - In the lower part of the triangle in the upper left corner, two lines have been made heavier, forming a "V". Secret marks were added to the dies of the 24 Cent - 90 Cent denominations, but no new plates were made from them. The 30 Cent and 90 Cent denominations are printed in different shades than the same denominations of the National Banknote Co. printings. There REALLY IS a Continental Banknote Company printing of the 24 Cent denomination (Scott #164). A proof of it is shown at the left (Sc. #164P4). Due to the plates being identical and the way the unstable purple pigment fades, there is no way to tell the Continental printings on hard, white wove paper from those printed by the National Banknote Co. However, only the Continental Banknote Co. used ribbed paper. ONLY ONE CERTIFIED EXAMPLE OF THIS STAMP EXISTS on ribbed paper, and it is unobtainable! The die used for the PROOF Continental 24 Cent denomination, however, DOES HAVE A SECRET MARK that differentiates it from the National Banknote Company stamps. On the Continental 24 Cent, the rays of the lower star on the right hand side of the banner are strengthened. If you want a Continental 24 Cent, this is the only way to go, and it only catalogs $50 in my 2004 Scott U.S. Specialized catalog! A "J Grill" of about 7 x 9 mm exists on all the US classic stamps Banknote Issue denominations, except the 24 Cent and 90 Cent. The grill was composed of truncated pyramids and was so strongly impressed that it often broke through the paper. They are all VERY RARE. In 1875, the Continental Banknote Co. issued a new 2 Cent denomination, printed in vermilion, and a new 5 Cent denomination, printed in blue. The new 5 Cent stamp pictures a facing portrait of President Zachary Taylor. 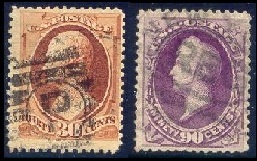 These stamps were printed on hard, yellowish, wove paper and are perforated 12. They are also shown in the images of the Continental Banknote Co. set above (Sc. #178-79). In 1879, the Continental Banknote Co. was consolidated into the American Banknote Co. The American Banknote Co. used many of the existing Continental plates. The 12 Cent and 24 Cent US classic stamps Banknote Issue denominations were no longer produced. Some of the American Banknote Co. printings are shown in the first two images above (Sc. #182-91). 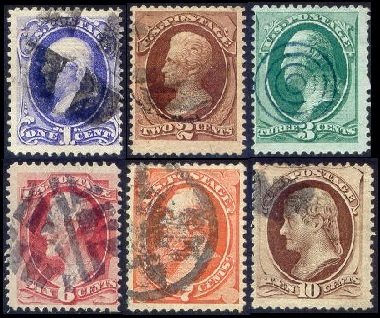 The stamps are printed on soft porous paper, almost like newsprint, and they are all perforated 12. These soft paper printings can be fragile. Mishandling can lead to creases and tears, and careless hinge removal will almost always result in a thin spot. There are two major types on the 10 C. denomination. The first type has the Continental "secret mark", as it was printed from one of the Continental Banknote Co. plates. The second type, which was printed from new American Banknote Co. plates, has no "secret mark". They are worth about the same, in used condition. 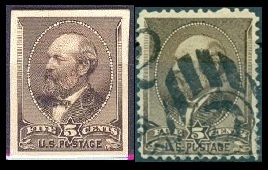 In 1882, the 5 Cent Zachary Taylor design was replaced by a new stamp, featuring the portrait of the recently assassinated President James A. Garfield. A plate proof and a used example are shown in the third image above (Sc. #205P4, #205). 1 Cent - The vertical lines in the upper part of the stamp have been so strengthened that they almost appear solid. 3 Cent - The shading at the sides of the oval is about 1/2 the previous thickness. A short horizontal colored dash has been added about 1 mm below the "TS" of "CENTS". 6 Cent - On the re-engraved stamps, there are three lines from the edge of the panel to the outside of the stamp. On the original stamps, there were 4 lines. The color is darker also. 10 Cent - There are 4 vertical lines between the left side of the oval and the edge of the shield. On the original stamps, there are five vertical lines. In 1883, two new denominations of US classic stamps were added by the American Banknote Co. The new 2 Cent, printed in red brown (shades), featured the bust of George Washington. The new 4 Cent, printed in blue green (shades), featured the bust of Andrew Jackson. They are shown in the bottom image above (Sc. #210-11). Between 1887 and 1888, the final US classic stamps of the Banknote Issue designs were released by the American Banknote Co. They are all shown in the images above (Sc. #212-18). A new 1 Cent denomination, featuring Benjamin Franklin, was issued, and the current 2 Cent, 3 Cent, 4 Cent, 5 Cent, 30 Cent, and 90 Cent denominations were re-issued in new colors. Between 1875 and 1885, special printings were made of almost all the US classic stamps issued by the Continental Banknote Co. (Sc. #167-77, #180-81) and the American Banknote Co. (Sc. #192-04, #205C, #211B, #211D). With only a couple exceptions, these US classic stamps are all exceedingly rare, and they are seldom offered for sale, outside of the major auction houses. For details, see the Scott Catalog. The following link(s) feature category-focused affiliated seller listings on various eBay sites worldwide. They may enable visitors to shop for and to buy specific items for the particular collecting subject they've just read about. The affiliated eBay seller auction lots provided by eBay, Inc. are not the responsibility of the management of this website. On high priced material, make sure the lots you are buying are properly authenticated.